The new BBC series Poldark, starring Aidan Turner and based on the historical novels by Winston Graham, has begun airing in 2015. It's the story of a British Army officer who returns home to Cornwall after the American Revolutionary War to discover that his friends and family thought he was dead and his fiancé is now engaged to another man. Are you watching it? 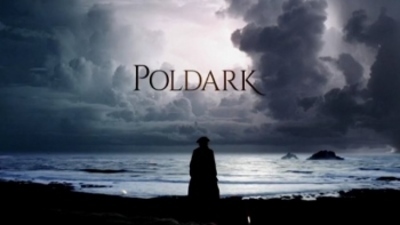 Poldark title card, BBC1. Fair use. I've been pretty keen to watch this one because I really like Aidan Turner and I enjoy historical dramas. I'll check it out on iView. Some people I know say they are enjoying it, but it is not particularly of interest to me. Yes, I am watching this as it is one of the very few good shows on at the moment. I really enjoyed the first episode, and like shows where you need to watch them all. Watched the original series' with Robin Ellis & Angharad Rees(RIP). Have read all the books. Loved both mediums! Have VHS taped new series', but not got to those tapes yet! Am slowly whittling away at my 'pile' of them! Am looking forward to it! Yes. Didn't catch the first series so hope the local library has it. Was I away from the English language news scene when the actor playing Uncle Poldark passed away? I was sad to hear that Warren Clarke is no longer with us. I loved him in Dalziel and Pascoe. Warren Clarke was just terrific in D&P. If you haven't seen it, get hold of it & watch! It's brilliant. Had virtually the 'who's who' of UK Stars' in it, at the time! Art Malik is the UK actor who was Ali Kumar, in 'Jewel in the Crown'! I just remembered! I was going too, but I had a back log of other ABC iview shows to watch, so I had to leave that 1 by the roadside, as they say. No, but only because I had to else to catch up on, before this 1 started!